HI! Thank You for Your Friendship! The cards I am sharing today is from a new stamp company. Atleast for me. I have sharing couple of cards using their designs before once. I am in love with their designs and the samples they share on social media. The new stamp company is called The Stamp Market. My package of their last release I bought arrived couple of days ago. So I played with them and produced two very simple stamped cards. Hello everyone, Welcome back to my blog. Today’s share is couple of back to basics kind of cards but these are my favourite kind of cards because I love simplicity, stamping and colours. Both the cards I am sharing with you are similar. One uses background stamp to stamp the background panel. The other uses floral stamps to stamp and create a stamped background panel. OK here we go with the first card. 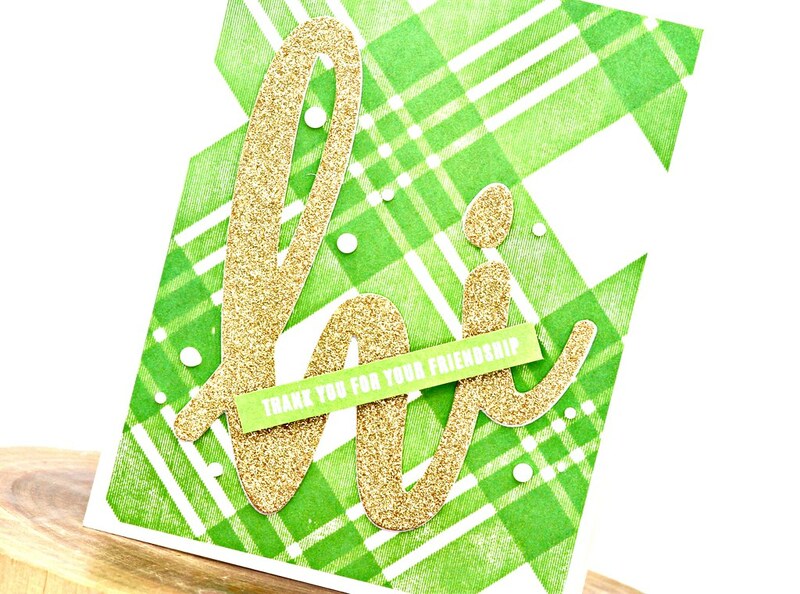 I used the Jumbo Plaid background stamp to stamp in TE Cilantro dye ink for the background. I used MISTI to stamp multiple times to get good coverage. I trimmed the panel to 4″ x 5.25″ in size and foam mounted it on a white cardbase. 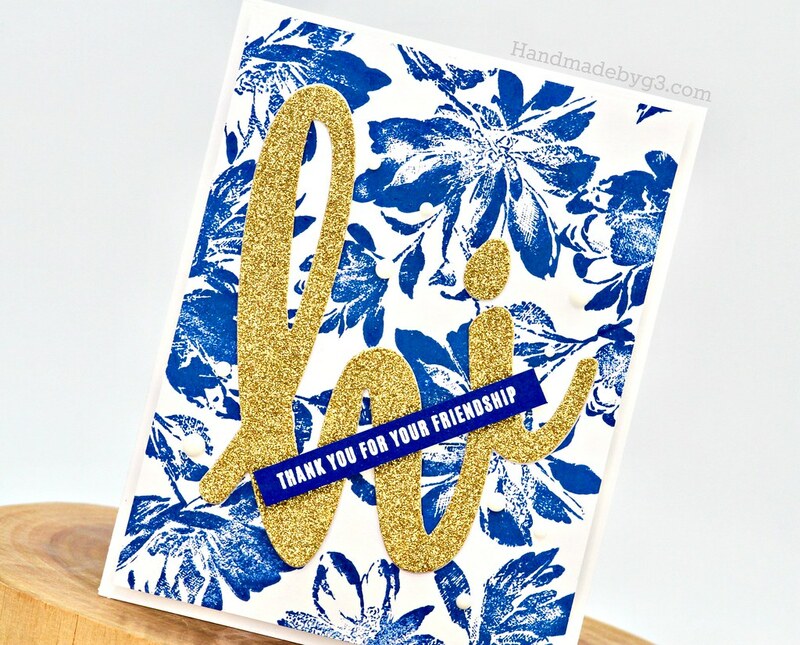 For the sentiment, I used the new the Big Hi Die, die cut using gold glitter cardstock as well as white cardstock to stack and glue them for added dimension. I adhered this die cut at an angle on the stamped background panel. The secondary sentiment is from Beyond Grateful stamp set which I white heat embossed on a strip of TE’s Cilantro cardstock and adhered on top of the Big Hi die at an angle again. Finally using white Nuvo crystal drops to tie in all the white elements on the card. I LOVE the Jumbo plaid background. 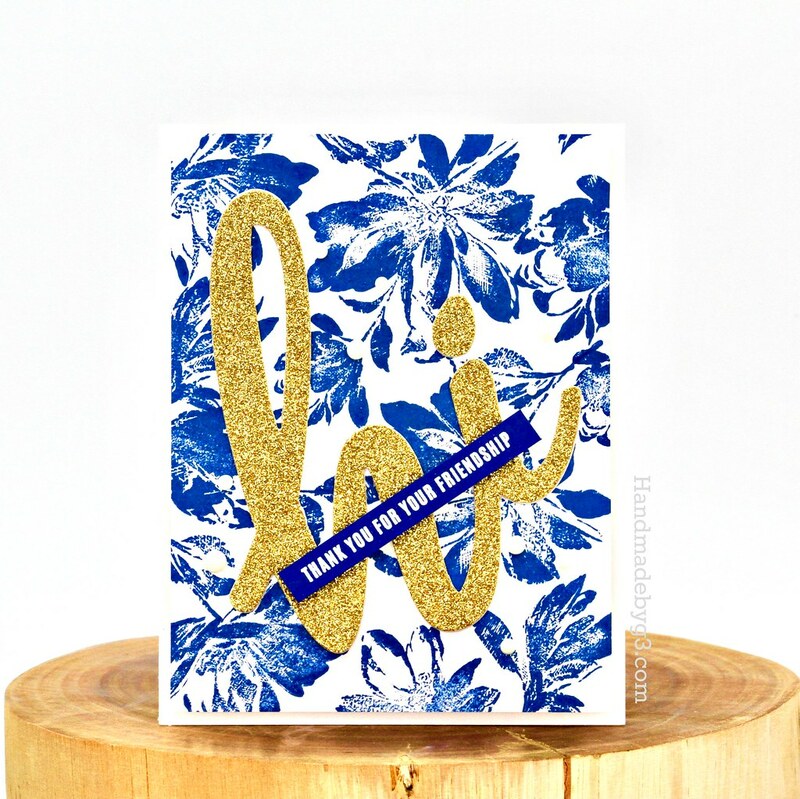 So pretty and detailed that all you need to do is just stamp with your favourite colour ink. Similarly, the big hi die is the hero of the card. Large enough to make a big impact. Love the stationery style clean look of the card. The second card is similar in layout and I used the Sketchy Floral stamps to stamp and create my own background. So on this card, I stamped the images from Sketchy Floral stamp set in TE’s Blueberry dye ink to create a background panel. Then I trimmed the panel to 4″x5.25″ in size and foam mounted it on a white card base. The rest is same to the first card. I love the bright ink blue colour of Blueberry dye ink from TE. The sketchy floral stamp is so beautiful. I enjoyed the process of stamping and getting a beautiful result. 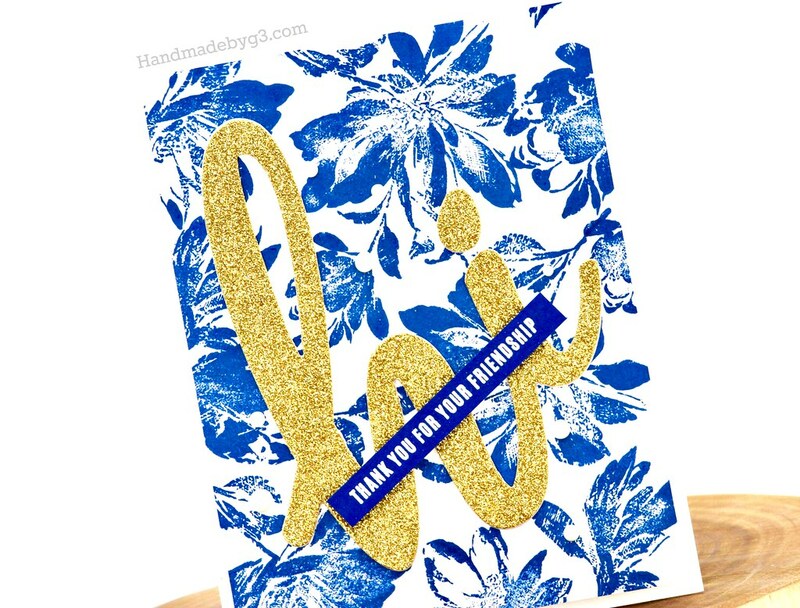 Also love the contrast of the blue on white and the gold glitter. I am also in love with this blue and green colour combination. These two will make a set of cards that can be gifted. 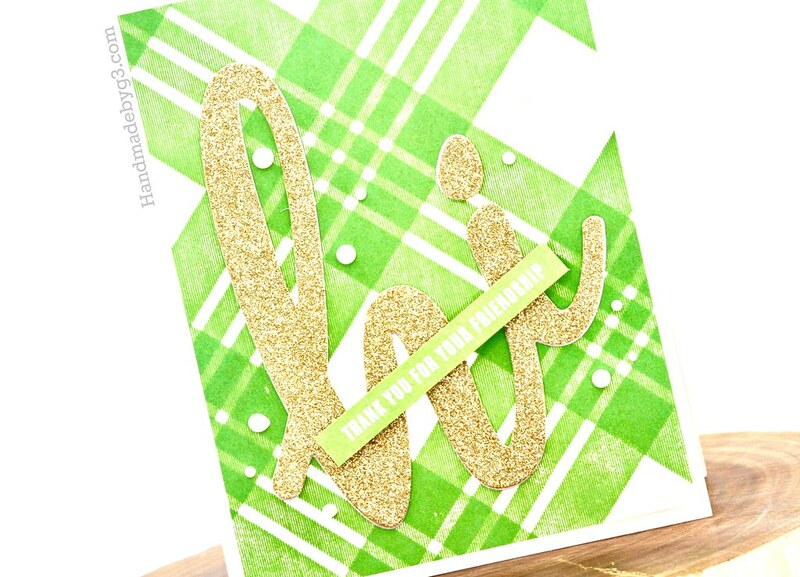 I cannot wait to make many more using The Stamp Market stamp sets and dies. Thanks so much for taking the time to visit my blog today.